Luckily for me, that’s exactly what happened when I noticed that Adam Kimble, who I’d worked with briefly at Red Frog Events, was making internet waves.Kimble, who I’d only known before as an Event Director with a friendly smile, just finished taking a year to travel with his wife and their Chocolate Lab, running and volunteering as they went. That led to him running some amazing races in Cape Town and the Gobi Desert. Not quite satisfied with those experiences, Minooka, IL native, Kimble recently set his sights on something even more ambitious: breaking the Guinness World Record for the Fastest Crossing of America (USA) on foot by a male – a 36-year-old record that stands at 46 days, 8 hours and 36 minutes. Adam’s shooting for 45 days, or an average of about 68 miles per day. I caught up with Adam in my favorite medium: questions and answers with dad-jokes thrown in. He played along like the great sport that he is. Enjoy and don’t forget to cheer him on when he starts running in February. Hi, Adam. How’s your day going? Hey, any excuse to catch up with an old co-worker and talk about running! So, when we last worked together a few years ago, I vaguely knew that you were a runner. Now, two years later, you’ve graduated to running ultras and soon taking on a Guinness World Record for running across the country. What the heck happened to turn you into a full-blown ultra maniac? You’re right. When we worked together I was in the beginning stages of my distance-running career. At that point, I hadn’t done an ultramarathon yet. I went from race to race, wondering what else my body was capable of. After a few marathons and eventually qualifying for Boston, I decided to give ultrarunning a try with the Leadville Silver Rush 50-mile race. I quickly realized that running ultras was meant to be a big part of my life. Now, I see the greatest value in encouraging and inspiring others to go after their seemingly impossible goals. Sometimes we want to make a change or try something new, but any number of things can hold us back. My hope is that in running these races I can challenge people to go after those dreams and make them a reality. I think we need some more background here. How did you get into running in the first place? I was a college baseball player at Bradley University and after I finished playing baseball, I felt pretty good about being done. People would ask me “do you miss playing baseball?” I would tell them that I didn’t miss the game as much as I missed the camaraderie and the competition. I was craving that competition. And once my wife asked me to run a half marathon with her before we got married in 2011, that internal competition began to grow in ways I never imagined. So when did you run your first ultra? My first ultra was a 50K in May of 2014 that I ran with some friends in Indiana. It was meant to be a training run for the Leadville 50. The conditions were a mess and at times we were up to our knees in water from some heavy rains in the week leading up to the event. In spite of that, everything went really well! My biggest test in ultrarunning was my first 100-miler (the Yellowstone-Teton 100) in September of 2014. A race of that length is all about what I like to call “riding the waves.” You feel great for 10 miles, you feel not so great for 10 miles. It’s just how it goes. I felt as strong finishing that race as I did starting it. It’s amazing how you body can adapt to such an intense physical challenge! Adam (Bib No. 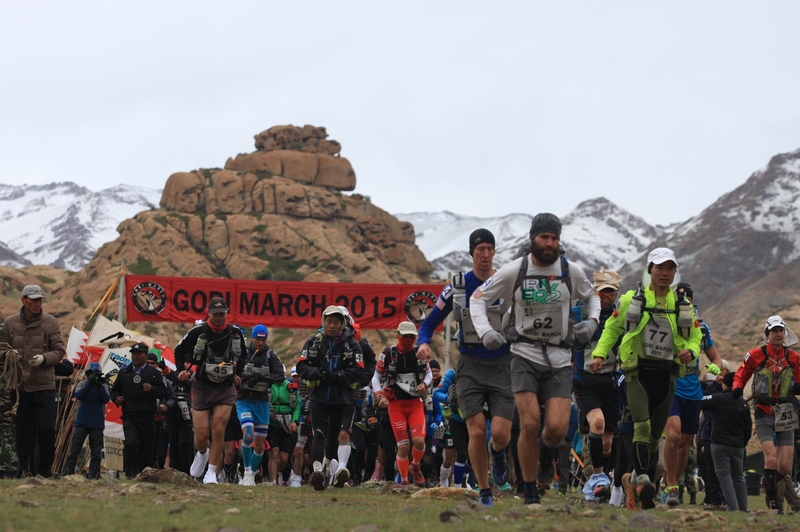 62) during the Gobi March, a 7 day, 250km foot race through (yup) the Gobi Desert. As someone who has a few marathons under my belt, I still can’t even imagine going the extra mile (ba-dum-CHHH) and upgrading to running ultras. 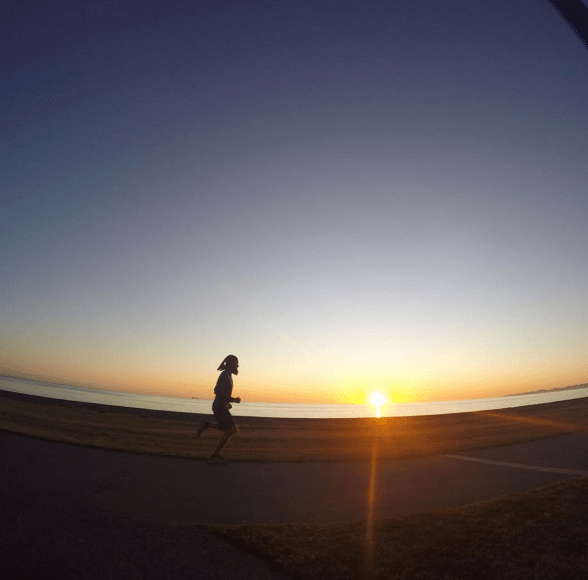 What did it take to ramp up your training from marathon level to ultra marathon level? The biggest change by far was getting more in tune with my body. I’ve run marathons before where I probably should have consumed more calories and been better hydrated, but I was still able to power through. When you get into a 50- or 100-mile race, mistakes like that are amplified because of the length of the course. Over time, I’ve been able to understand what my body needs and when it needs it. Nutrition is so important. Outside of that, it was just increasing the weekly mileage and amping up the training regimen. When you’re running races that last for days at a time, there’s got to be a hundred unexpected things that pop up and affect your race. Have you ever had any “oh, CRAP!” moments during a race? How do you prepare for them, if that’s even possible? To me, it’s all about the mindset. There are always going to be those “oh, crap!” moments, but you just have to expect that you will need to deal with them. The one thing you don’t want to happen is to be under-fueled or dehydrated, because it’s pretty hard to bounce back from that. An unexpected bathroom break in the woods, however, is probably going to happen at some point! Let’s talk a little bit about the upcoming challenge you’re taking on: attempting to break the Guinness World Record for Fastest Crossing of America. How’d this pop up on your radar, and what made you decide to do this? Also, are you crazy? It all started when my wife, Karen, and I were driving down the Pan-American Highway in Chile with our dog, Sofi. We were driving this beautiful highway, and I said to Karen, “wouldn’t it be crazy to run the highway from top to bottom?” Later that month I met a guy who had biked across the USA and he was telling me about his experience. I took my original idea, blended it with his, and here we are. A lot of people think what we’re doing is crazy, and I don’t blame them! But I know it’s exactly what I’m supposed to be doing. What will a typical day on the course look like for you? Will you have rest days, or is it going to be non-stop? An average day will require us to be on the course for about 17 hours. We will wake up at 3:15, get something to eat and be out and moving by 4:00. From then until about 9 p.m. we will be out covering miles, with about two to three hours built in for meals and breaks. I’ll also be eating snacks constantly while we’re out during the day We need to cover an average of about 68 miles per day to finish on schedule, so I’m planning to run, walk and hike in order to meet our daily goal. At the end of the day, I will fuel up with anything else I need and then focus on recovery before getting to bed around 10 p.m. We don’t plan to take any rest days at this point in time, just because we want to build in some extra time in case we get behind schedule. It will also be important to get into a strict regimen and replicate it every day, and a day off could really jeopardize that fluidity. Are there any particular parts of this run that you’re especially looking forward to? Any sections that you know will be tough that you’ve had to mentally prepare for? Honestly, I’m looking forward to all of it! It’s going to be an incredibly different and exhilarating way to see the United States, and I’m pumped for it. Mentally I’m focused on day one right now, because we will achieve our goal by taking it one step at a time (literally). 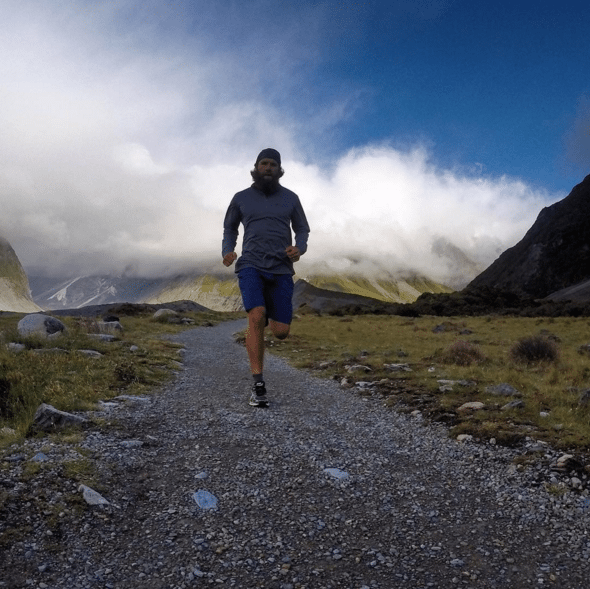 Running is typically thought of as a solo sport, but when you’re tackling a challenge as big as this one, you obviously can’t do it on your own. Will you have a pit crew for this record-breaking attempt? You’re absolutely right! This couldn’t be done alone. I’m so grateful that we will have five permanent crew members to assist us along the way! The team consists of my wife, Karen, Adam and Lindsey Nubern (our friends we met traveling internationally), and my friends and former co-workers, Clayton Dorge and Josh Mohr. We’re also hoping to meet a lot of friends, family and running buddies along the route! I’m still completely baffled at the thought of running 70 miles in a day. Let’s start small: what advice would you give to someone thinking about running their first ultra? Personally, my advice would be “Run, but in the opposite direction, as fast as you can”- but I’m sure you can come up with something more inspirational. Be committed. That’s the best advice I can give! Anybody can run an ultra if they put their mind to it. I really believe that. You have to willing to put in the miles when you don’t feel like it, and continue pushing through fatigue when your body wants to stop. It comes down to hard work and mental strength! True or false: Having a huge beard makes you run faster. True! Don’t let aerodynamics tell you otherwise. Approximately how many “Hey look! It’s Forrest Gump!” jokes have you gotten while running? I’ve gotten my fair share. My favorite one was in Australia last October. I ran by this golf course and there were three women playing a round of golf together. I ran past them, not anticipating any sort of interaction, when after I had passed them I heard one of the ladies yell, “Run, Forrest! Run!” It was pretty awesome. Adam, you’ve been a gem. Thanks for putting up with my lame jokes and naive questions. How can we keep up with your record-breaking attempt and cheer you on virtually along the way? It’s my pleasure, Kristen! Your questions were great and I appreciate you taking the time out of your day. Anybody that wants to be a part of our journey can follow along with us on Facebook, Instagram and Twitter and through our website at www.adamkimble.com. We will be integrating live tracking so you can see where we’re at and cheer us along the way!